Too many jobs! And a review. I am in the midst of switching jobs, but already started a new one 3 weeks ago. Sadly, between that and working a couple days as well at Scuderia West, it's been killing my spare time. I need to update some things on my site and will attempt to do that by next weekend. I will be changing the reviews page to make it more useful. Hopefully I can get that done when we ride (Yeah!) down to SoCal next weekend. 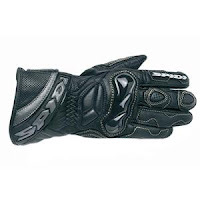 In the meantime, I just wanted to share my latest purchase, a pair of Spidi Strada Womens' gloves. I needed a better pair of summer gloves with protection and perforation. As much as I'd love a pair of Racer High-End gloves, (see a review of the Racers from WebBikeWorld here), I just didn't want to spend that much. I purchased a pair of Lookwell unisex gloves last year, but the velcro on them is already falling apart! I also wanted a glove that was a little thicker, but not insulated like the Racer Multitops (see a review of these here) that I already wear mostly year round. I know, you're thinking, "how many pairs of gloves does she have??" Too many. Just ask my husband. The Stradas retail for ~$99.00. They are perforated in between the fingers and I definitely love that feeling of wind between my fingers, especially when it's mildly hot and/or humid in San Francisco ( a rare occurrence, but it does happen!). I think I'll be taking them with me as we ride down to SoCal, as they will come in handy when we hit some hot spots. I've found them to be super comfortable, well ventilated and exactly what I need with San Francisco's and the Bay Area's microclimates. Older PostAnother Job. New gloves.